Worksheets can be organized under categories (buttons of the menu). Navigation through the worksheet tabs becomes fast and easy ( from a few sheets to many). The tab names become legible immediately. 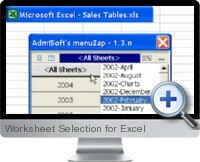 The Worksheet Selection add-in for Excel allows a more rational distribution of the data into several sheets. Worksheets can be linked to several buttons and be sorted differently in each button of the menu. The Worksheet Selection add-in for Excel helps to organize, update, analyze and show data and graphs much more efficiently within Excel based models.